This benefit is generally found on cards with annual fees, but it can easily pay for itself. Here are cards that offer the perk. Sure, traveling is fun — but the airport itself can quickly lose its appeal thanks to delays, squalling babies, crowded restaurants and the hunt for electrical outlets. The right travel credit card can help you ditch the chaos and get access to a lounge with things like complimentary food and drinks, much-needed personal space, and even sometimes a bed or shower. First, though, it helps to know your options. Different credit cards unlock the door to different kinds of airport lounges for you — and maybe even for your guests. These cards typically charge an annual fee, but they can save you several hundreds of dollars on an airport lounge membership plan. Priority Pass lounges: Priority Pass is a network that offers members access to over 1,200 airport lounges worldwide. You can access these lounges by purchasing a membership plan through the Priority Pass network or by applying for a credit card that offers complimentary Priority Pass Select membership. Airline-specific lounges: Some airlines have their own exclusive airport lounges. You can sometimes get in for free if you purchase a business-class or first-class ticket. Otherwise, you’ll have to pay for membership, and the cost generally varies according to your frequent flyer status with the airline. But a co-branded airline credit card can offer free visits to these lounges. 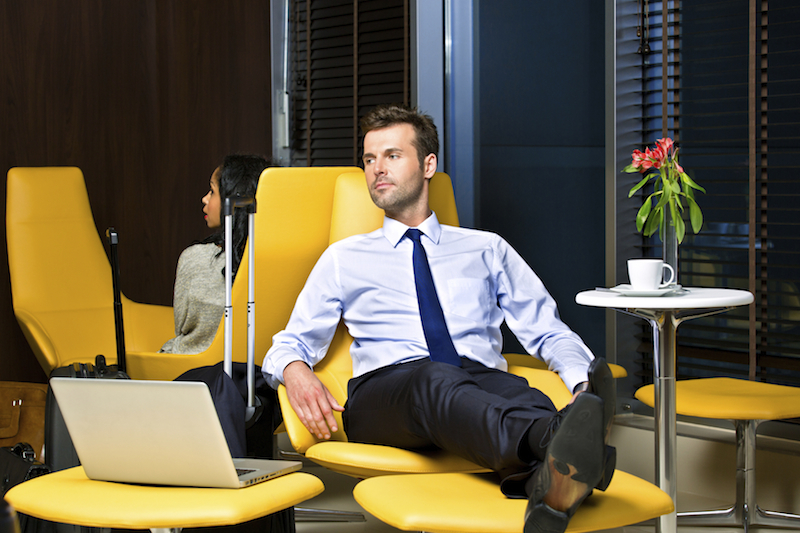 Exclusive membership: Some airport lounges are even more exclusive. The American Express Global Lounge Collection, for example, is available only to cardholders of The Platinum Card® from American Express and to Centurion members. Terms apply. The American Express Global Lounge Collection includes AmEx’s Centurion and International American Express lounges, Delta Air Lines Sky Clubs, Priority Pass Select, Plaza Premium and Airspace lounges. Combined, the network offers access to more than 1,200 lounges across 130 counties. The Platinum Card® from American Express gives you access to lounges in the American Express Global Lounge Collection. It offers 5 points per $1 spent on airfare purchased directly from airlines or booked through American Express Travel; 5 points per $1 spent on hotels booked on amextravel.com; and 1 point per $1 spent on all other purchases. Terms apply. A $200 annual airline fee credit for checked bags, in-flight meals and other travel expenses. Up to $200 annually in Uber credits for rides in the U.S.
Up to $100 in application fee credit for either TSA PreCheck or Global Entry. The Delta Reserve® Credit Card from American Express offers complimentary access to Delta SkyClub lounges. You can also bring up to two guests, for a cost of $29 per person, and get a hefty discount on airfare for one of them with the card’s annual companion certificate. Taxes, fees and terms apply. The certificate is good for one round-trip domestic flight in first class, Delta Comfort+ or the main cabin. Terms apply. If you combine the value of both perks, it more than makes up for the $450 (This offer is no longer valid on our site) annual fee. You can also collect miles as you spend. This card gives you 2 miles per $1 spent on qualifying purchases made directly with Delta and 1 mile per $1 spent on all other eligible purchases. Limited Time Offer: Earn 75,000 Bonus Miles and 5,000 Medallion® Qualification Miles after you spend $5,000 in purchases on your new Card in your first 3 months. Terms Apply. (This offer is no longer valid on our site) Medallion Qualification Miles (MQMs) are generally earned based on how far you fly and the fare class of your ticket, but this bonus offers a head start. A free checked bag for you and up to eight other passengers traveling on the same reservation. 15,000 bonus miles and 15,000 MQMs after spending $30,000 or more in eligible purchases on your card in a calendar year, and another 15,000 bonus miles and 15,000 MQMs after spending $60,000. Terms Apply. If you’re not loyal to any brand, the Chase Sapphire Reserve® can also offer access to over 1,000 airport lounges worldwide through Priority Pass Select. This card, too, packs a lot of value for frequent travelers in the form of perks and rewards. It has a $450 annual fee. You don’t have to pay an excessive annual fee to get your foot in the door. The Hilton Honors American Express Ascend Card, for example, offers complimentary Priority Pass Select Membership and 10 free lounge visits per year. It has a $95 annual fee. This card gives you 12 points per $1 spent with a hotel or resort in the Hilton portfolio; 6 points per $1 spent on all eligible purchases at U.S. restaurants, U.S. supermarkets and U.S. gas stations; and 3 points per $1 spent on all other qualifying purchases. Terms apply. Earn 125,000 Hilton Honors Bonus Points with the Hilton Honors American Express Ascend Card after you use your new Card to make $2,000 in eligible purchases within the first 3 months of Card Membership. Terms Apply. A Weekend Night Reward from Hilton Honors after you spend $15,000 in purchases on your Card in a calendar year.